Sangria is great and all … *Screeching record sound* Actually, you know what? It’s kind of not great. Most of the time it’s just an easy way to make not-great wine tolerable by loading it up with sugar and almost-turned fruit. The best possible outcome from making it is a Farmer’s Almanac-worthy headache and a pitcher or bowl from which you’ll never get the fruit pulp out. Pass. We’ve established that there’s no point in completely covering up a bottle of Ribera del Duero or Rueda via sangria, but maybe you still want to enjoy a fancied-up drink that tastes good and lets your wine shine a bit. There are plenty of directions you can go, with either red or white, that won’t bombard you with sugar or leave you picking fruit remnants out of your teeth. The Kir: OK, from the get-go, let’s get this out of the way: The Kir and its snazzier cousin the Kir Royale (made with Champagne instead of white wine) are decidedly French creations. But take a step back and put on your Spanish thinking cap, and it makes sense to bring Rueda into the mix. 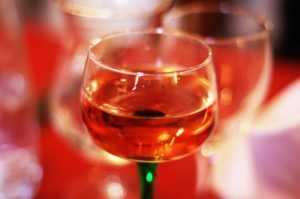 The traditional Kir is a mixture of Creme de Cassis and white wine made from France’s Aligote grape. The main characteristics of Aligote? Super-dry, highly acidic and no oak — which sounds a lot like most Rueda Verdejo wines. TheKitchn suggests a ratio of 1/5 Creme de Cassis to 4/5 white wine — but make it work for you by adjusting to your tastes. Tinto de Verano: Essentially translated as “summer red wine,” the tinto de verano is a mash-up of a spritzer and a lemony sangria. A mixture of red wine and lemon-lime soda spiked with lemons, this is a perfect solution for anyone who doesn’t dig white wine but can’t endure the thought of sipping a red in 90-degree heat. Saveur’s dead-simple 1:1 ratio is a good starting point, but here’s our pro tip: Cut down on some of the soda and use seltzer to minimize the sugar and maximize your ability to taste the Ribera del Duero you’re using in this drink. Also, oranges — especially blood oranges — are a magical substitute for lemons. Rueda Granita: Making your own granita shouldn’t be intimidating. The process is quite easy, and once you’ve done it, you’ll be confident and ready to have a granita to punctuate every meal. 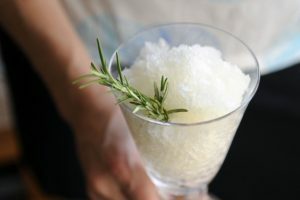 Food52’s rosemary white wine granita caught our attention, but when making it with Rueda wine, consider subbing in lemon thyme or basil, either of which would sing magically alongside Rueda’s stone-fruit and green apple flavor profiles. Herbs like tarragon would also make a nice addition here — feel free to experiment with whatever herbs you have or whatever looks best while shopping. New York (via Spain) Whiskey Sour: What does wine have to do with a whiskey sour, you might ask? You might also be asking: Who the heck drinks whiskey sours anymore? Well, friends, much like many other nostalgic food and drink recipes that have enjoyed a resurgence recently (see: the Manhattan, Negroni, deviled eggs), they’re making a comeback — albeit with better and more natural ingredients than they used to have. This riff on the drink from Bon Appetit features a red wine float on top. Do you know what the best part of a float is? One person’s float is another person’s drink, meaning you can increase the level of wine and cut back on the whiskey portion here. This would accomplish two things: you can drastically reduce the alcohol levels, and the minimized amount of oaky bourbon would help supplement a nicely oaked Ribera del Duero—rather than having the wine merely cut the throat burn of the whiskey. The Bazaar by José Andrés is kind of like Willy Wonka (Mr. Andrés, in this case) meets a tapas restaurant, and Rachel Macalisang is the wine brains. There's a Hungarian-Venezuelan fellow pairing our wines with American Southern cuisine in Miami and Las Vegas, and we couldn't be happier about it. Growing up and even during his college years, Alex LaPratt had his eyes set on becoming a doctor.